An article from our Board President, LesLee Hacker on being invited to attend the ribbon cutting ceremony to open the Fred and Pamela Buffett Cancer Center. On Tuesday, May 23rd, 2017, our family realized a dream. 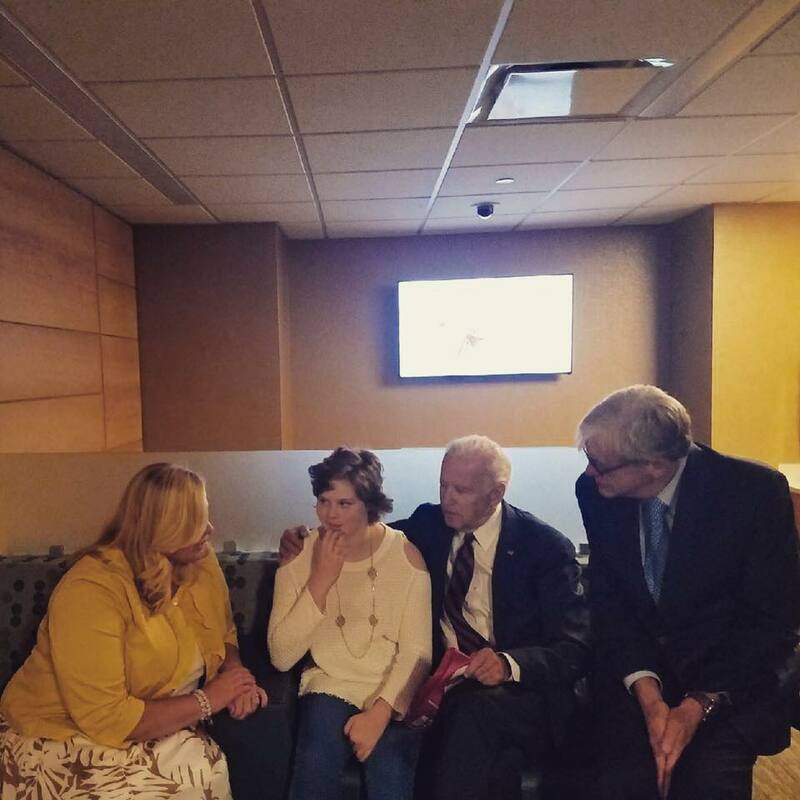 Almost exactly a year ago, Lauren was in the hospital at Children’s and Congressman Brad Ashford came up to her room to visit her. It was his son’s wedding day, but he made time in the morning to give hope to a little girl and to a family. Brad Ashford came to see us. I could tell it was a great connection. He was interested in Phil because Phil is a Veteran and so was my father. He loved Lauren because even though she was very ill, she perked up and smiled at him and welcomed him into her hospital room. He was kind to me and as a father could relate to the difficulties of watching your child endure horrific treatments. It touched his heart. We had a couple months left in the hospital and we had already been there a couple of months. He got to know Lauren and asked who she admired. Lauren told him she loved the Vice President. She loved the way he cared about kids like her. Our whole family grieved when his son Beau died. Beau was a Veteran, like Lolo’s Dad. He had cancer like our daughter. We felt connected to the Biden family. Towards the end of Lolo’s treatment, she became gravely ill. She was septic and had ulcerative colitis and a condition called typlitiis. Our friends, fellow parishioners, and even some people we didn’t know prayed a rosary outside Lolo’s window. Congressman Brad Ashford and his family are also Catholic. They showed up outside Lolo’s window. Lauren turned the corner. She fought hard. She left the hospital and started her freshman year at Marian. Fast forward a year……we are getting ready to end Lolo’s freshman year. Jonathan graduated from Creighton Prep this last Sunday on May 21st. We had such a fun weekend with family in town. But, on Saturday morning I received a call from Brad Ashford. He was in DC and the connection wasn’t great. Vice President Biden was coming to Omaha the following Tuesday and he asked if Lauren and I could be there. There were very few tickets to get into the event, but he was able to find two tickets for Lolo and me to be there. He said he wasn’t sure if she could meet the Vice-President, but we were just happy to celebrate the opening of the Buffett Cancer Center with everyone and hear the VP speak. We wanted to hear his thoughts on the future of cancer care and research. ON that day, the biggest excitement was an extra ticket became available and Jonathan jumped in the car in his suit in a matter of minutes. He was beaming. We were greeted by Ann and Brad Ashford, along with our neighbor and friend Chris Kratochvil and his son Harrison. Chris is the associate vice chancellor for clinical research at UNMC. His daughter Blaire just graduated from Marian High School and was a Senior on our Lolo’s Angels, Inc. board. They grew up on the block next to us. It is a small world in Omaha. As a military brat, I have never experienced community like I have in Omaha. 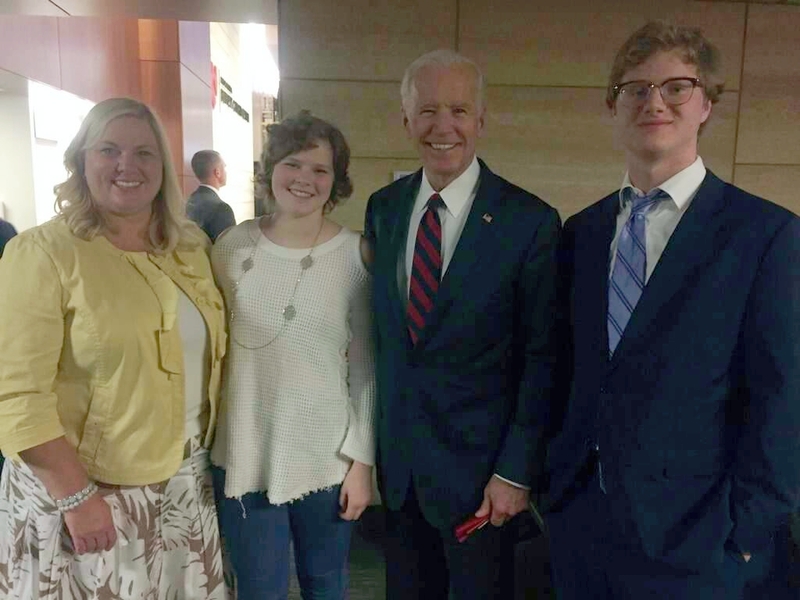 From the support Lolo experienced in the hospital to days like getting to meet the Vice President with the Kratochvils. Omaha is a community that cares about each other. The event was very small, there were about 100 tickets given out. Lauren and I were surprised to find out that we were seated next to Pamela Buffett and Vice President Biden. I was a bit weak-kneed. Lauren and I spent time before the event meeting many of the directors of the UNMC programs and the benefactors of the Fred & Pamela Buffett Cancer Center. We were excited to meet Drs. Michael & Gail Yanney. Their house was built by my brother-in-law in Hawaii. Like all the people that we met, they were generous and kind to us. I am in awe of people that are brilliantly successful that spend their life in the service of others. This was the experience that day. Vice President’s Biden’s speech felt like our family dinner table. As you can imagine, since Lolo was diagnosed in 2012, we talk about how cancer research needs to change. We talk about our ideas and people we read about that are making changes. Most of the people we talk about are involved in VP Biden’s Cancer Moonshot Initiative. Vice President Biden is very knowledgeable about cancer and the direction that cancer care and research needs to change and grow in the future. He talked about saving lives, incredible nurses, and how curing cancer is possible in our future. The biggest change needs to come from the way research is done. It needs to be a collaborative venture. Currently, researchers are proprietary about their research. They want the credit and the money for their research. It isn’t because they are horrible people. It is because they need to secure their chance at getting grants in the future. Vice President Biden and his team are breaking down walls with legislation that requires the collaboration of research ideas, when that research is funded through government. At the end of Vice President Biden’s speech, as he was walking out, he grabbed Lauren’s hand and said, “Come on!” He also then told me to follow. We went off to a private room with the Ashfords and his director of the Moonshot Initiative Greg Simon. He hugged Lauren. He reassured her. He talked about his son, Beau, and his granddaughter Maisy. Lauren turned and said she was sad Jonathan didn’t get to meet him. Joe Biden chuckled and grabbed her even tighter. He said his best friend in the whole world was his sister. He was proud of Lolo that she was thinking of her brother. So, he asked for someone to please go get Jonathan. Jonathan got pulled from the crowd, past secret service, and was able to greet Joe Biden. He thanked him for meeting our family. 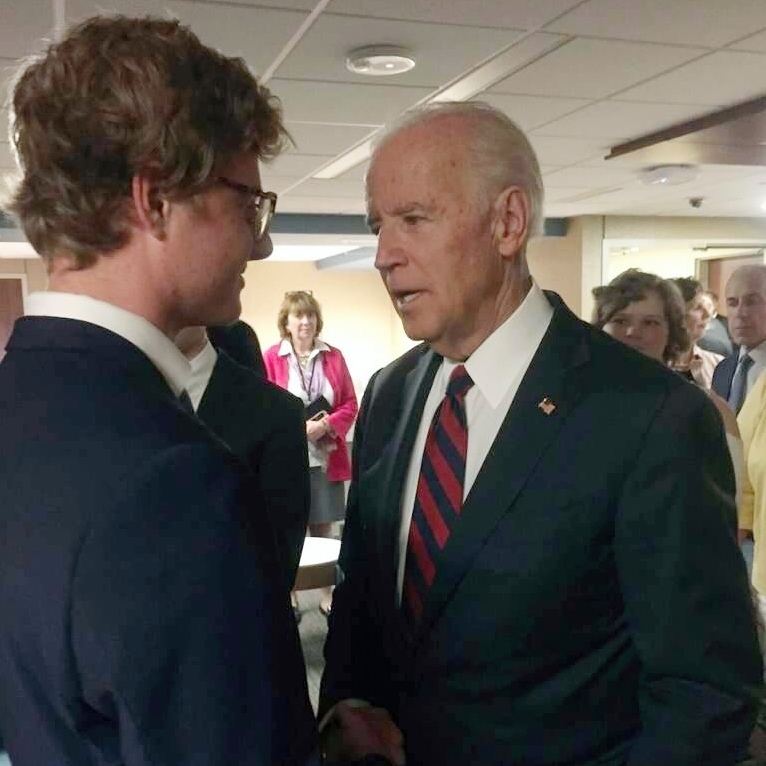 Jonathan and Harrison talked to Joe Biden about graduating from Creighton Prep and their college plans. Harrison is at SLU and Jonathan will be a freshman next year at University of Utah. Both of the boys were thrilled to meet him. 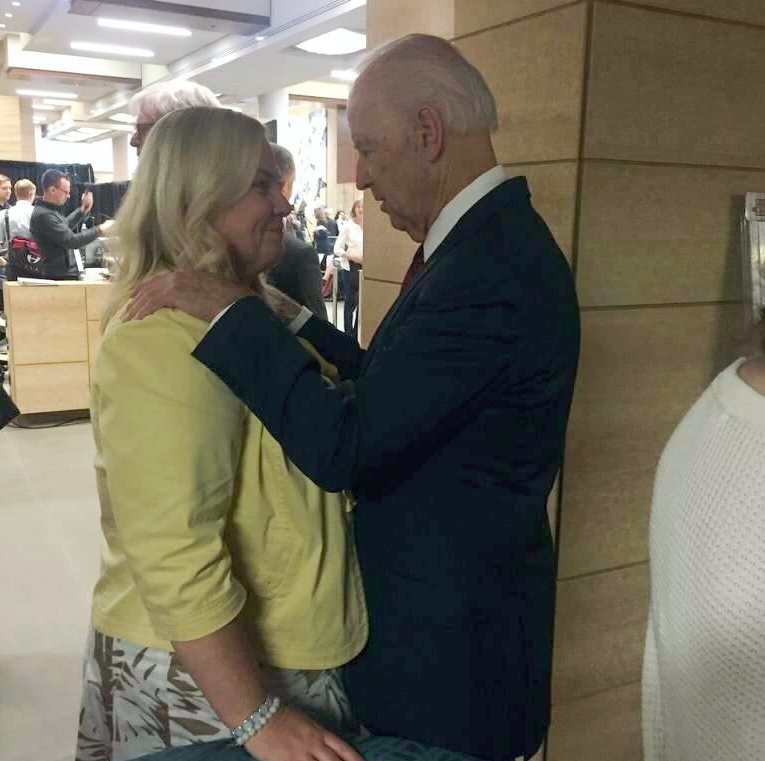 Then, the Vice-President came and hugged me. He whispered to me that he knows how hard all of this must be on me. I broke down. He promised to help us. He gave me hope about Lolo’s future. He told me it was all going to be OK. Our time with Joe Biden was a dream for our family. I wish Phil could have been with us, but of course, he was keeping the world safe for democracy to shine! This time with the Vice-President healed our family in many ways. It gave us so much hope for the future. It made us feel like there are people out there that are making a difference for kids and families touched by cancer. It also inspired us. Our dinner table each night has been filled with awe and talk about the real heroes in our country right now. People like Joe Biden that take hardship and heartache and open their hearts wider. Joe Biden could have become focused on other things after his time in office. But, like our family, cancer chose him and he will fight it until his last breath. He is a warrior and is leading an army. This is the same with Pamela Buffett. After her husband, “Fritz” Fred Buffett died of pancreatic cancer, she chose to make this cancer center come true. All of these contributors will save people’s lives. Having great medical care within reach changes your outcome when you are faced with cancer. I feel so blessed that my children were able to shake the hand of a man that I once called a hero and now call a friend. We will continue with our work at Lolo’s Angels, Inc. to fight pediatric AML. Our whole organization is dedicated to this mission.